In this article, we short-list and review only the top 2 bamboo pillows currently available on the market. Our aim is to provide you with the essential information needed by reviewing these products to help you to decide which is the best bamboo pillow for a quality and refreshing sleep. Your pillow should provide the upper posture support that’s right for you. If you are suffering from neck pain, headaches, allergies, and general tiredness, then you should take a look at your sleep environment, especially the pillow that you may have been using for years. Even if you have no obvious signs of discomfort, it is worth considering that there may be other pillows which are better suited for your individual sleep needs. It may only involve swapping out your old pillow for a fresh new one to immediately feel the improvement in your sleep quality and overall well-being. There are two main dominant brands for bamboo pillows: Coop Home Goods, and Snuggle-Pedic. Here, we have simplified the comparison of both brand's bamboo pillows to make it easy for you to decide which is suitable. The Adjustable Shredded Memory Foam Pillow by Coop Home Goods is the #1 best selling pillow on Amazon.com. The biggest feature that makes this pillow unique is it allows you to adjust the amount of fill inside the pillow so you can elevate or reduce its loft. If you prefer a high and plush pillow support, or a low and firm support, or anything in between then this pillow can be adjusted accordingly. A zipper gives access to the inside fill – simply unzip and insert or remove the amount of fill needed. This flexibility is beneficial if you want to try different adjustments for loft height and firmness until you find the one that is perfect for your own sleeping style. A removable patterned cover is included with the pillow and the inner case is made of interlock fabric which is the tightest knit that gives it a smooth surface feel. The pillow comes in various sizes: standard, queen size, king size, kid size, camping size, and a large body size variant. Research and development, we tried down pillows, buckwheat pillows, synthetic pillows, memory foam pillows, latex pillows, you name it we’ve tried it. Now we combine those good attributes into this pillow. But it all starts with the foam, this foam is made here in the U.S – it’s premium, certipur-certified foam, meaning it’s been tested for no harmful chemicals. Now, we’ve spent a lot of money on the foam production because this is really the base of the pillow and allows the pillow to be adjusted, it’s what you’re laying your head on every night now it’s important that you have pure foam. 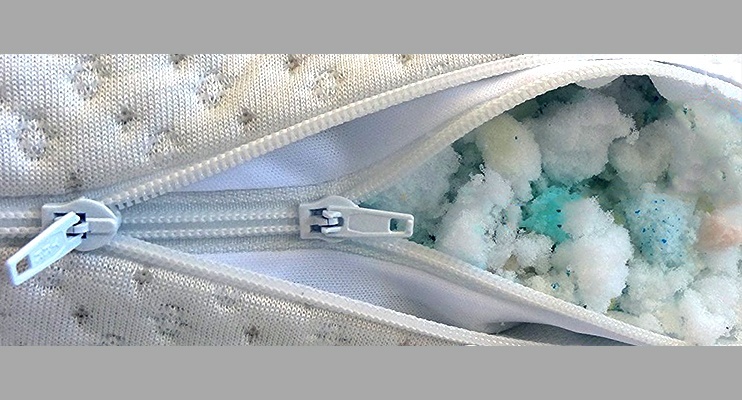 Now, there’s other pillows on the market that are from overseas and are questionable and this is the foam that’s coming out of them. As you can see, there are different colors, chunks, densities. Since we’ve got nothing to hide, this allows our pillows to be fully adjustable – you can add or remove foam for the perfect height. Now, we’ve got different body frames – we’ve got body builders, ﻿﻿football ﻿﻿players, and ballerinas and ﻿﻿children﻿﻿. Everyone’s different – it’s not fair to have everyone adjust to their pillow – the pillow should adjust to them. Now these are both the same pillow. This one’s right out of the box – there’s a lot of foam here and it’s great for side sleepers that need high loft. This one has had a lot of foam removed, and it’s great for someone who is a stomach sleeper that needs low loft. As you can see I’m going to put the same force down and you can see how different the support is. Now, to be honest, a lot of us move throughout the night. For example, if you’re a side sleeper, you want some high loft. So in this side of the pillow to have a lot more support, but sometimes say you roll over and are sleeping on your stomach, now this side is nice and low so you are not over extending your back. Now your sleep position is really important, as you can see I’m sleeping on my side and this pillow is a little too high and you can see that by the angle of my head. Now if I adjust this pillow to the right size - now you can see I’m a lot more aligned and this is how you want to spend eight hours at night – this is how you’re going to get the best sleep. Now on my back, you can see this pillow is too high for me and my neck is angled up. If you switch to the right pillow, now you can see that there is a much better alignment – and this is how you want to spend your eight hours at night. Now, as a stomach sleeper this pillow is much too high. Our pillows come with plenty of loft but just in case you need more we do have more available. The Bamboo Shredded Memory Foam Pillow by Snuggle-Pedic is another highly rated pillow on Amazon.com. This pillow uses shredded memory foam which enables it to conform better and mold to your upper neck and head when rested. This pillow is thick in width but can be fluffed and molded while still retaining its shape. 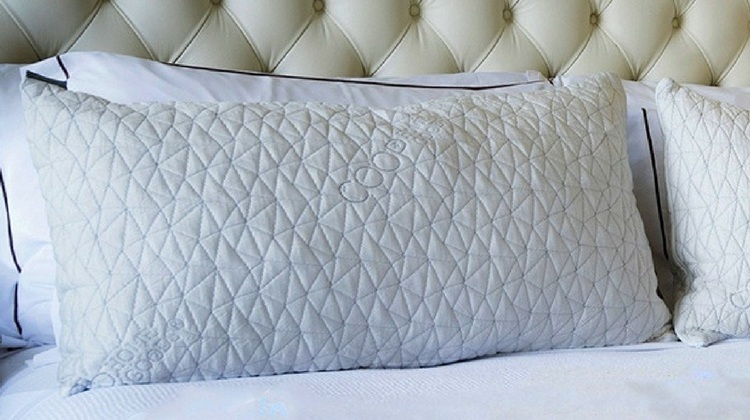 A great feature of this pillow is its breathable, vented cover which allows air to circulate throughout - keeping the pillow cooler and ventilated while you sleep. 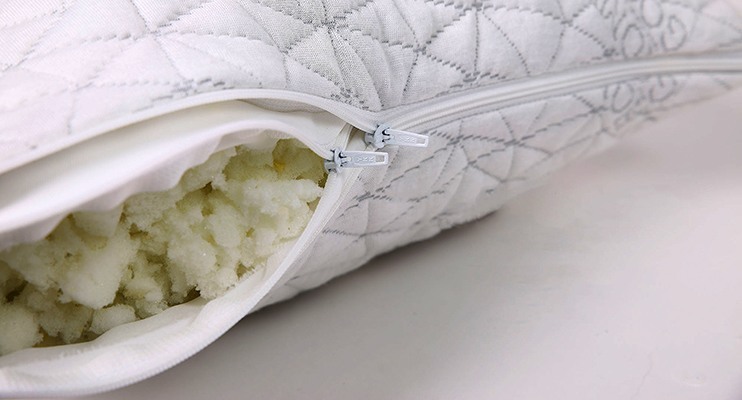 The pillow's loft is adjustable - the zipped cover opens allowing for the fill to be removed or added. The pillow comes in various sizes: standard, queen size, king size, kid size, and a large body size variant. We consider the following points to be the minimum that the product should have when choosing the best bamboo pillow for your sleep needs. Based on Amazon.com, the market leaders of bamboo pillows are Coop Home Goods and Snuggle-Pedic. These two companies manufacture their pillows in the United States. The product should meet Certi-PUR-US standards for emissions, performance, content, and durability. 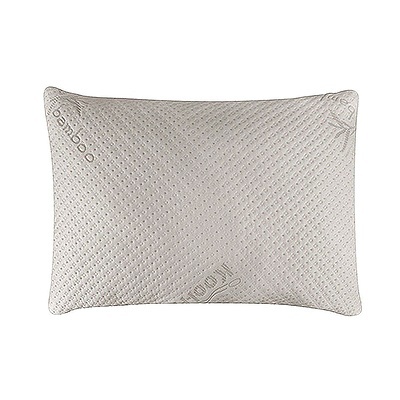 The Adjustable Shredded Memory Foam Pillow by Coop Home Goods is our choice for the best bamboo pillow. 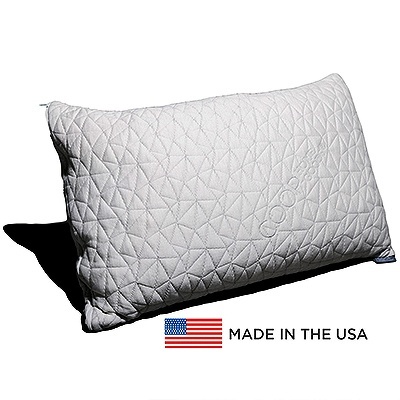 Made in the USA, this pillow shows quality throughout. Finely shredded memory foam provides the pillow with ample fluffiness and bounce to keep your head supported and rested comfortably. Adjustable fill makes this pillow a one-size –fits-all choice to suit everyone’s pillow height needs. Small details shows that the pillow is made without compromises in quality: its use of a consistent color and size of shredded foam fill shows that it is not made from scraps, and the inner cover made of interlock fabric gives it a smoother feel. One of the many benefits of this bamboo pillow is it comes with a 5 year warranty and a 30 day money-back guarantee, which would be enough time to decide if this bamboo pillow is right for you. You can try it with a comfortable﻿ mattress that is also suited for your needs. Overall, the Adjustable Shredded Memory Foam Pillow by Coop Home Goods will meet your needs for a supportive and comfortable pillow.